The Road to the Horizon: Ham Radio, Anyone? November 2001. Somewhere on the road between Bagram and Kabul. I am not a happy camper. And that is an understatement. Before we left, I emphasized them to keep a watch for us on our monitor frequency. And now, I call them, and … nothing, nada, ziltch. The sun is already set behind the mountain tops. Even though the sky still has a hint of a dark-blue afterglow, it is already dark. And when I say dark, I mean pitch dark. There is not a single light. 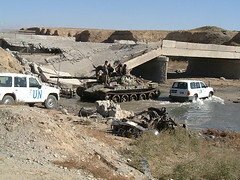 The headlights of the trucks in our convoy beam into a void as they negotiate twists and turns of this bombed road. They light up nothing but emptiness. And bomb craters. And little flags marked ‘Mines’. But for the rest, I can not describe it in any other way but “Void-ness”. Absolute empty-ness. There is nothing in this part of the world. There is nothing that grows. There are no houses. No-one lives here. There is only light brown dirt. Dirt and bits and pieces of mangled war-toys. A rusted tank, half buried in the sand. Or a rotor blade from a helicopter sticking from a pile of rubble. But for the rest, dirt. I can not believe this part of the world has been a battleground for the past twenty years. The last fierce battle was only four days ago. The Northern Alliance meets the Taliban. One-nil. Taliban lost and evacuated Kabul. And we moved in with the relief convoy. I curse, check another frequency they sometimes use, but still nothing. The radio room is not answering. It is Ramadan, and this time of the day, the radio operators in Kabul, twenty kilometers away, are probably gone praying, or are already at the Iftar, breaking their fast. We just flew in a C130 cargo plane full of food, and I went with a convoy to pick it up from Bagram airport, few hours truck-drive from Kabul. We can’t use Kabul airport yet, as a one ton unexploded bomb sticks out of its runway. And we don’t have any deminers in yet. 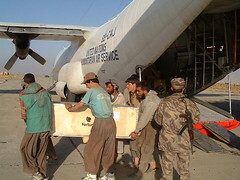 Nobody is allowed to come into Kabul, except twenty expatriate aid workers. I am one of them. And the only one on this road. The only one outside the Kabul safe haven. I must be crazy to do this. At any time, I expect to see the flare of an RPG coming straight at us, as rumours say there are still rogue Taliban roaming in this area. We desperately need to get hold of "someone" in Kabul to inform them this convoy is on the move, and that "someone" needs to monitor us, just in case something would go wrong. “What to do? What to do? How on earth can I get hold of Kabul.. Hmm let’s see.” I dial another frequency on the HF radio in the car. No UN frequency, but a ham radio call frequency this time. One push on the auto-tune button and in a few seconds, the radio beeps and displays: “14.195.0 – Antenna Tuned”. I push the button on the microphone and ask “Frequency in use?” Not a beep. I wonder if this radio is receiving or transmitting at all. Maybe that is why the radio room did not copy me. Even though all worked well before we left. - “Frequency in use?”. Nothing again. Hmm.. Ok, well… let’s try. - “CQ 20, CQ 20, YA5T/m YA5T/m YA5T/m , CQ 20 and by.”, I launch my call. "YA5T is my callsign in Afghanistan. With the prefix "YA", the hams will know what country I am transmitting from. And the world explodes on this tiny radio. 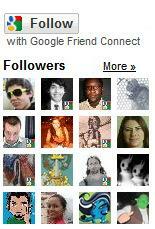 Dozens of hams answer my call. From Europe, North America, Asia. Shivers run down my spine. I can not believe this. Here I am sitting in a car, driving on what once was a road, with probably dozens of Taliban waiting to take a shot at me, in the middle of bloody nowhere. And still, with this small piece of hardware, I have the world talking to me… You have no idea how this feels. YOU HAVE NO IDEA…! It takes me one minute to get ‘ON4WW’-Mark, my friend in crime on frequency. He is at home in Belgium, I am in a car in Afghanistan, but his radio signal booms in. I pass him the satellite phone number of the control centre in Kabul –just in case something would happen- and he remains on standby for the next two hours until we safely reach Kabul. Even though in the middle of nowhere, we were not alone. I had hundreds listening in. From all over the world. Weird stuff, hey, ham radio? How do you explain that to outsiders? 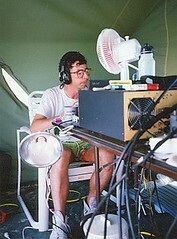 How do you explain not only what ham radio is, but also what it meant to you, in your life? How it changed the course of my life in many ways? Last year, I started to write down some of these stories in my eBook. Ham radio. A sharp bend on the road of my life. As I wrote down these stories, I started to realize - it does sound rather melodramatic, but it is true to state - that “ham radio has changed my life”. If no ham radio, I would not have done the Clipperton expedition in 1992, I would not have experienced the adrenaline kick that operating from a remote Pacific island gave me. I would not have done the expedition to Howland the year after. Then I would not have met Paul, F6EXV. 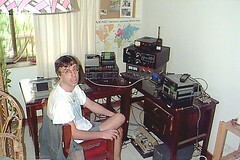 Paul as co-operator then, and as one of my ham contest partners at John-ON4UN’s home. He would not have received the telephone call –during that contest- offering him a job at the UN in Congo. He would not have explained me what that work was all about, which raised my interest. Less than year and one expedition (Peter I island in the Antarctic) later, I flew to Angola, for the Red Cross, on my first humanitarian mission. My job had nothing related to my education – I am a graphical engineer – nor with my professional experience – I was an IT manager in my last ‘normal’ job-, but I was to install radios. I did work which was solely based on my experience as ham operator. In the end, there is no difference between going on an expedition, fiddling around with generators, debugging antennas and raising masts, if it was on Peter I island, or in the middle of Africa. Well, true, they did not shoot at us on Peter I… But for the rest, there was no difference. There is not one single memory that stands out. They are all different in their own way. But if there was one time where I felt *really* lucky I was a ham radio operator, it was that one night, in the midst of nowhere, in Afghanistan, just a few weeks after 9/11 ! This is an edit from an article I wrote for the 2007 yearbook of the Northern Californian DX Foundation (NCDXF). Check out more ham radio related stories in my eBook. Great story and one of many that I have been looking for to continue to show the value of Amateur Radio in the world today. Despite all the "modern" gear that is being deployed, Amateur Radio still is getting the job done...and this by people that are doing it as a hobby. long time we didn't hear you on the radio! I always enjoyed listening to you handling the pileups from yet another exotic location. 73 es hope to work you again. I do miss the kick of a good pileup, though!